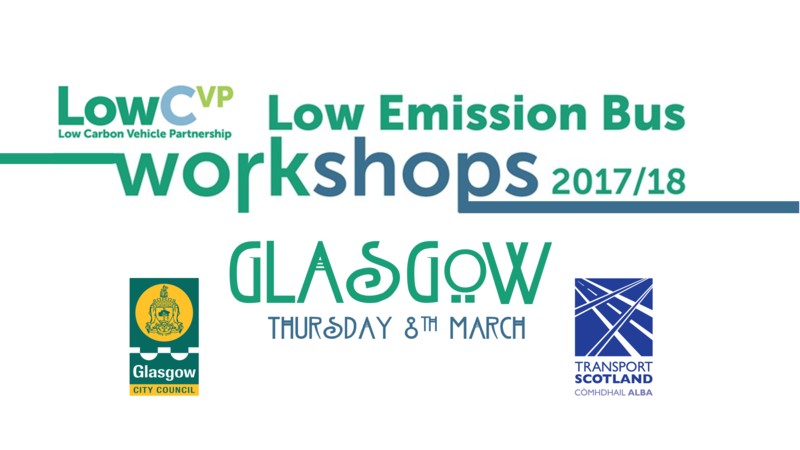 The fourth in the series of Low Emission Bus Workshops, this time being held in Glasgow, Scotland. The LowCVP is set to host their fourth regional Low Emission Bus Workshop in Glasgow on Thursday 8th March 2018 at the Scottish Event Campus (SEC). The free morning workshop will provide local authorities and bus operators with information on new technologies and fuels, sharing operator's experiences of low carbon and low emission solutions for bus fleets around the UK, including retrofit SCR projects. LowCVP are set to host their fourth regional Low Emission Bus Workshop in Glasgow on Thursday 8th March 2018 at the Scottish Event Campus (SEC). The free morning workshop will provide local authorities and bus operators with information on new technologies and fuels, sharing operator's experiences of low carbon and low emission solutions for bus fleets around the UK, including retrofit SCR projects. Councillor Anna Richardson, Glasgow City Convener for Sustainability & Carbon Reduction, will open proceedings and highlight the opportunites that Glasgow has in becoming the first city in the UK to introduce a Low Emission Zone. Delegates will also hear from operators and local authorities on their experiences of low carbon and low emission technologies. There will also be the opportunity to meet Low Emission Bus manufacturers, fuel suppliers, retrofit electric and hybrid powertrain providers, telematics providers and exhaust aftertreatment suppliers. LowCVP will continue to host more workshops in 2018, focusing on areas set to introduce Clean Air Zones and Low Emission Zones. Presentations from the previous LEB workshops in Manchester, Leeds and Nottingham are also available to download from the LowCVP website for free.